December’s birthstone, the Blue Topaz, a beautiful mineral admired over the millennia. It is found in all continents in the Western Hemisphere as well as Europe. Pure Topaz (a silicate mineral of aluminum and fluorine) is clear, and color variants, such as yellow, orange, green, white, blue, and pink (the rarest), are due to impurities. The Blue Topaz is categorized into 3 shades: Sky (light blue tones), Swiss (medium tones), and London (the darkest blue hue). London Blue Topaz is considered the most valuable (and therefore coveted) of the three. It is also the rarest to find naturally, as the blue is created due to large amounts of heat or irradiation from the sun. The Sky & Swiss are the most commonly found, making them the more affordable for everyday use by a broader population. Topaz can be readily cut into most any size and shape to fit many jewelry designs. Because of the sparkling blue hue it makes for a beautiful piece of jewelry. When shopping for gift ideas for those with December birthdays, earrings (drop or stud), and shaped stones for rings or necklaces will look spectacular. And Topaz looks grand as a pendant or pin to take an ensemble from attractive to beautiful. Giving Blue Topaz as a gift choice for December birthdays is not limited to December: consider it for Valentine’s Day, Easter, Mother’s Day, or Anniversary. She’ll appreciate her birthstone gift any time of the year, and don’t forget: she’ll need a jewelry box as beautiful as the jewelry she wears to keep it safe and secure! Unique Holiday Gift for Him? Try a Beautiful & Elegant Watch Case! Coming up with a gift for the man who has (almost!) everything can be difficult, and sometimes we default to an old stand-by: t-shirt, socks, gift certificate. But we’d like to suggest this idea: an elegant watch case. Did you know that, according to Timex, the average man in the U.S. owns 5 watches? This is the one indulgence that men everywhere seem to have, but why? Well, it seems that men (generally, not all) prefer function as fashion. They will typically have two higher end watches for work or formal events, a medium brand digital watch for knocking around on the weekend, a sport’s watch, and a very casual watch. In the case of pilots or SCUBA divers, they’ll also have a watch that acts as a tachymeter (to measure ground speed) and timer (to measure decompression times). More recently, we have watches that also track biometrics: heart rate, sleep pattern, steps, etc. Given the number of watches that a typical man owns, a natural gift is a watch case. Men’s watch boxes come in a variety of sizes and capacity, as well as materials like cherry, burl wood, maple, teak and leather. The most popular ones are the classic leather boxes, though more and more have a glass top on the men’s watch box. Others may prefer solid tops with locks, especially if the watches are expensive (and numerous). A nice addition to a watch box is a pull out drawer, which can keep cleaning supplies, pocket change, or money clips. If you purchase a mens watch box for him, a great idea is to add an engraving with his initials or a message. As a real surprise, add a new watch to the inside of the box before you wrap it: two gifts in one! And if he’s a connoisseur of higher end watches (self-winding, or automatic, watches), consider a watch winder as well. This Christmas season, Chasing Treasure has terrific values on a large variety of men's watch storage boxes that cross the pricing spectrum to provide wonderful value at almost every price point. 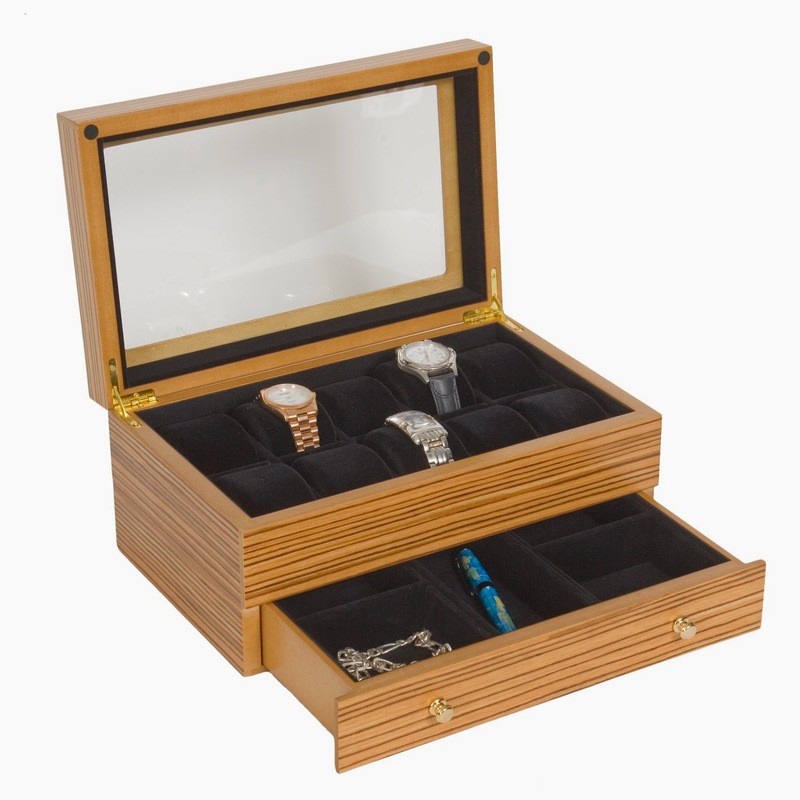 Our wide choice of men's watch boxes at Chasing Treasure means you are sure to find the perfect watch box that will have a lasting impact on that special man. Engraved Name - The Personalized Touch! An engraved name plate adds just the right personal touch to a jewelry box gift, and are available for ChasingTreasure's jewelry boxes, armoires, music boxes, & watch cases. There are three basic types of personalization: initials, monogram, and message. The initials are of the recipient, not the giver (seems obvious, yes, but we have been asked! ), and can be two or three initials. In the case of two, the order will be the first letter of the first & last name, in that order. If three initials, a middle name is added and the order is first, middle, last. For monogram style, all three initials are used, with the order altered to be: first name initial, last name, middle name, with the last name initial more prominent with a larger font. Messages are obvious and can be the recipient’s name, or, more likely, a special event such as an anniversary, wedding, or engagement. Longer messages can go to two lines, which is almost always the max number of lines for an engraved plate. Obviously, the longer the message, the smaller the type, and we at ChasingTreasure limit to 23 characters total. While many jewelry boxes comes with nameplates directly from the manufacturer, most are shipped separately, where the recipient affixes the plate to the jewelry box him/herself. There is no concern about the quality of the attaching glue, as the adhesive used is extremely strong. So strong, in fact, that you have to be very careful that you place it correctly the first time, as removing it will damage the underlying wood (a reason why we cannot accept returns with the plate attached). Brass or nickel finish, script or block font, make up the selections. The most popular choice is brass script, and arrives in 3 to 4 days from shipping, and the plates are laser engraved. Whatever the occasion, an engraved plate gives a wonderful personal touch to be remembered through the years and decades to come, and a perfect luxury jewelry box gift for a wife! Holiday Special - Receive a FREE Engraved name plate with any American Chest jewelry box purchase at ChasingTreasure.com, a $25 value.